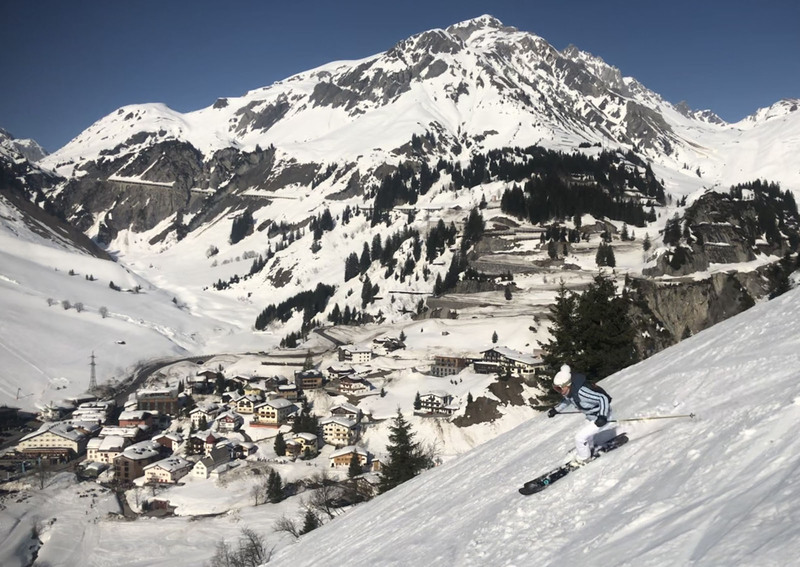 The Arlberg ski region of Austria isn’t just superb skiing and spectacular Alps scenery. Western Austria’s high elevation winter playground has haute cuisine too. 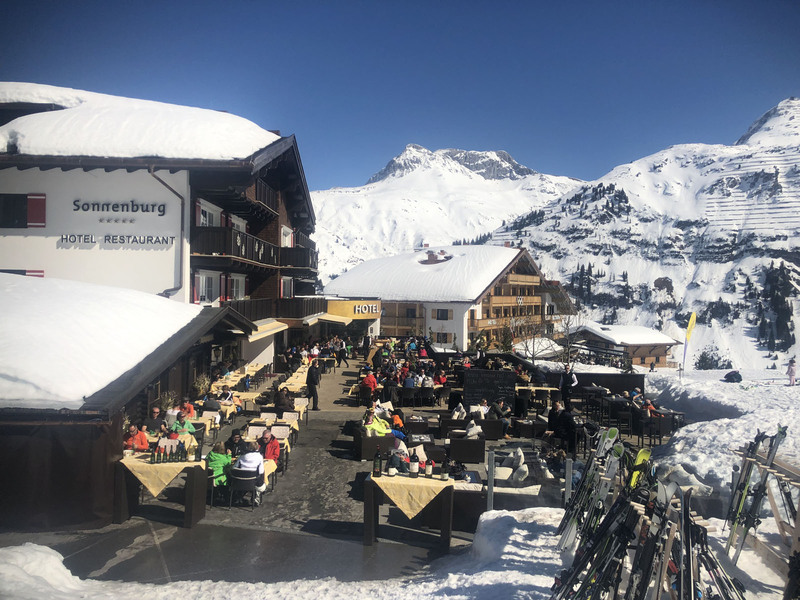 The joy of skiing is creating an appetite for Tyrolean treats at the many ski-to chalets and restaurants – over 50 on-mountain restaurants in The Arlberg ski region, 18 in just St Anton! 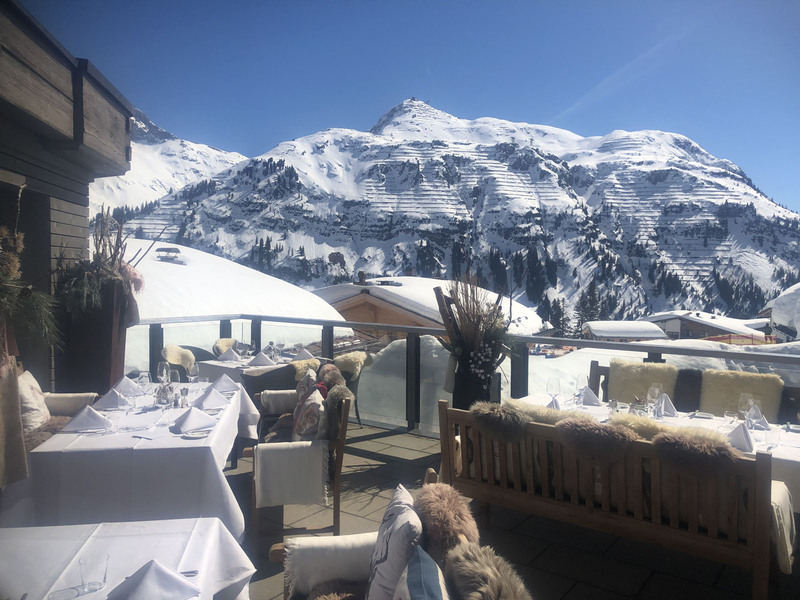 And these charming huts are not just serving “good food” with great views… many are Gault Millau Guide award winners. 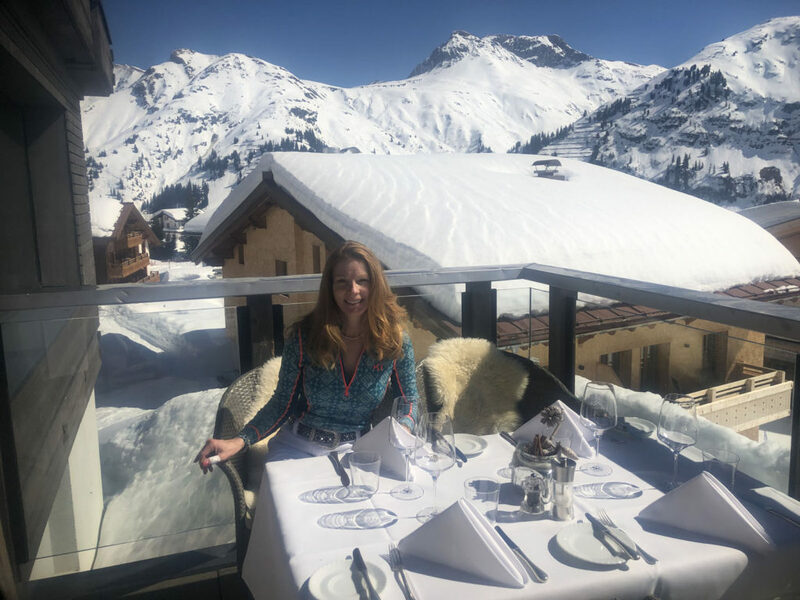 Here are a few top mountain restaurants we dined at in St Anton am Arlberg, Stuben, Lech Zurs, and Oberlech, from classically cozy chalets to chic lodges and luxury ski-in hotels. 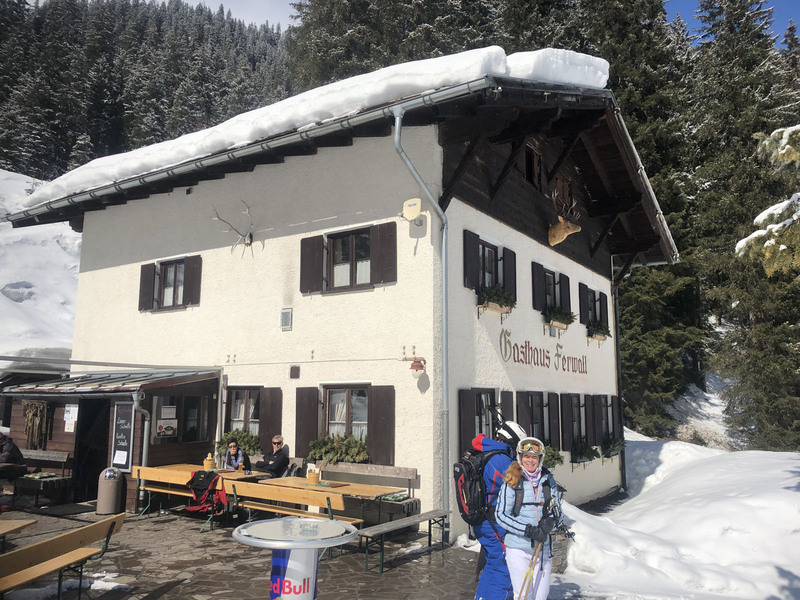 Hospiz Alm St Christoph is a classic for a traditional Austrian lunch. 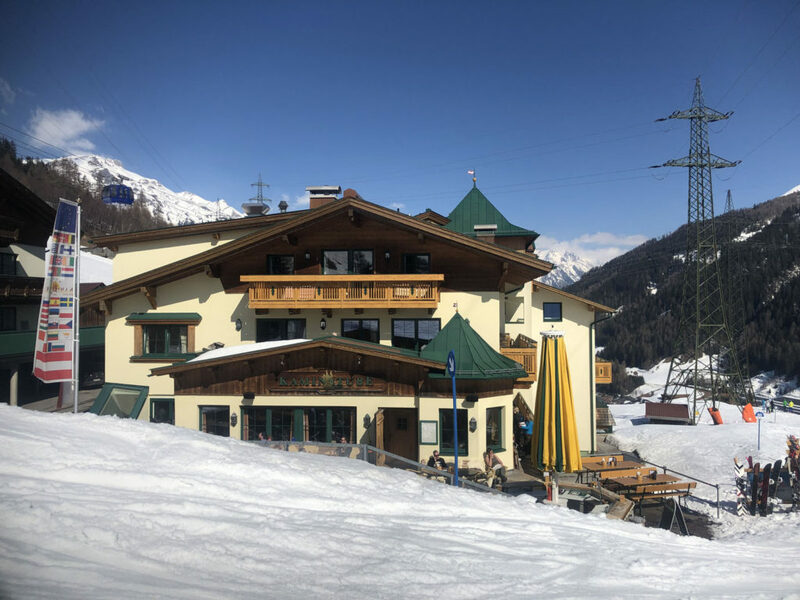 This gorgeous wood chalet sits at the base of St Christoph’s slopes inviting you in. 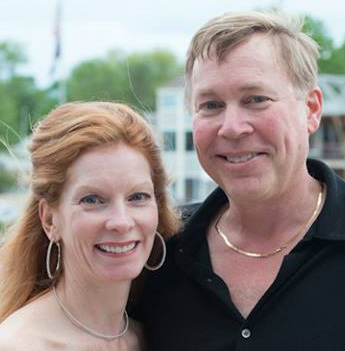 Enter through old wood doors to the rustic and cozy interior, get a seat by the fire in a wooden booth. 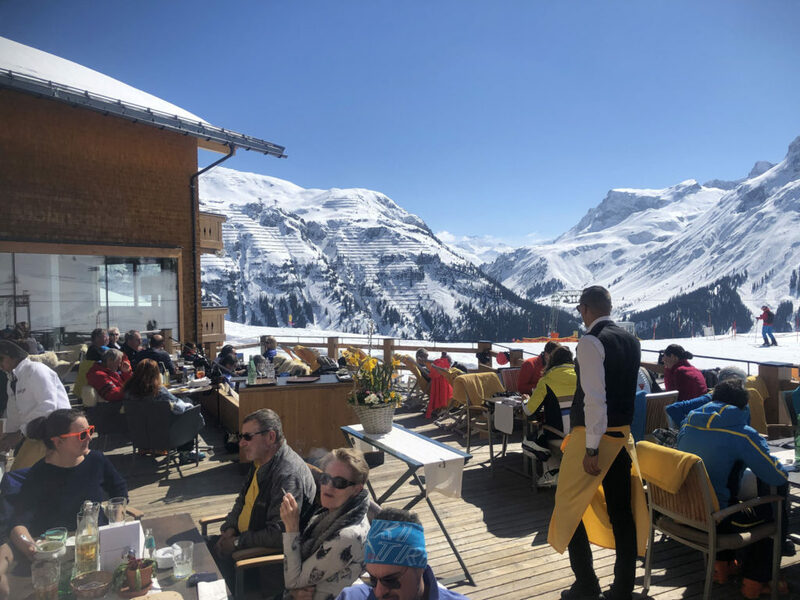 The outside sun terrace is gorgeous and popular on spring ski days. Or ask for the swank upstairs balcony. 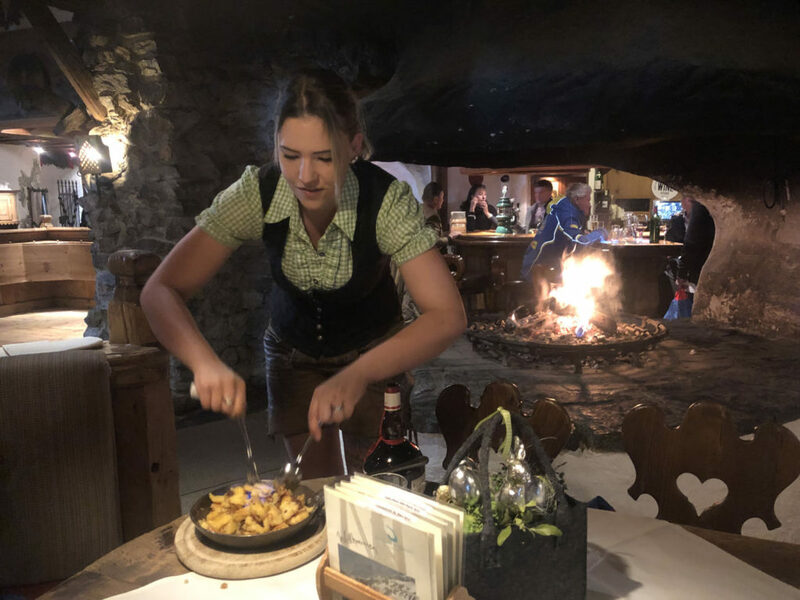 Hospiz Alm’s typical Tyrol scene includes lederhosen waiters and fraulien, beer steins, plates of brat and cheese and Rösti potatoes, apple strudel and traditional Austrian music. 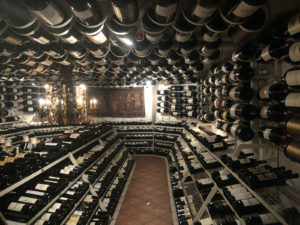 Don’t miss the slide to the water closets and Adi Werner’s wine cellar – behind an amazing locked door is the world’s largest collection of big bottles, mostly Burgundy, priced up to $85,000 Euro. 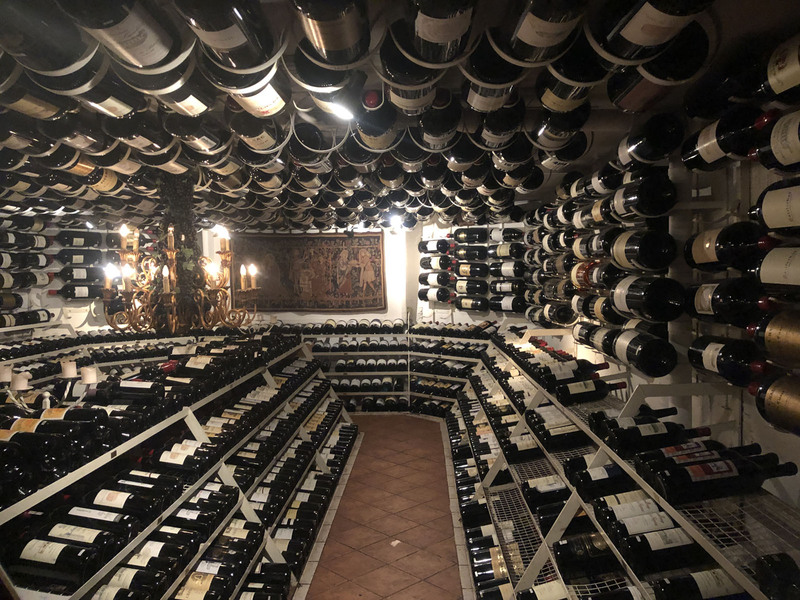 The wine cave, under the chalet’s après ski dance floor, holds 3,000 custom large bottles that contain 18 liters of wine each (about 140 glasses of wine per bottle)– so get your friends together to splurge on one of these grand cru. For dessert share the Kaiserschmarrn dessert (translation: Emperor’s mess) served flambé with Grand Marnier. 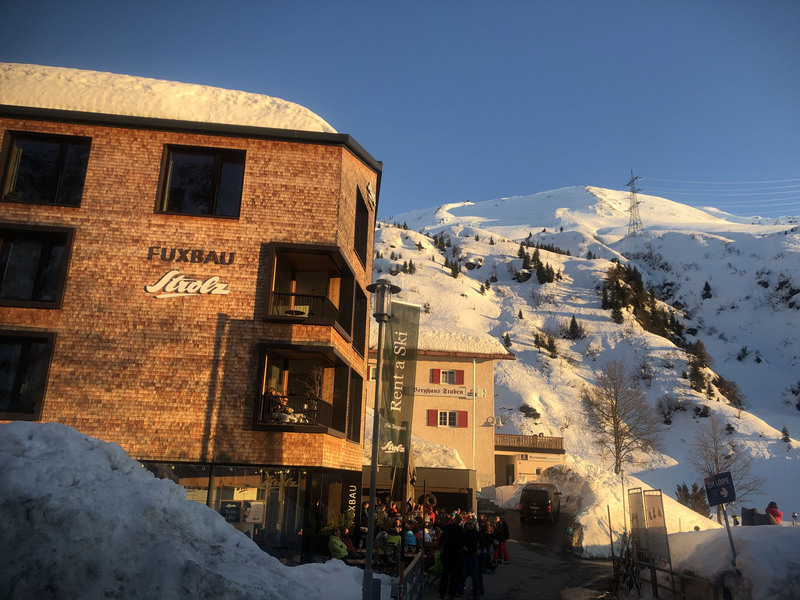 Fuxbau in Stuben is worth skiing down Trail 104 into this charmingly small ski village. 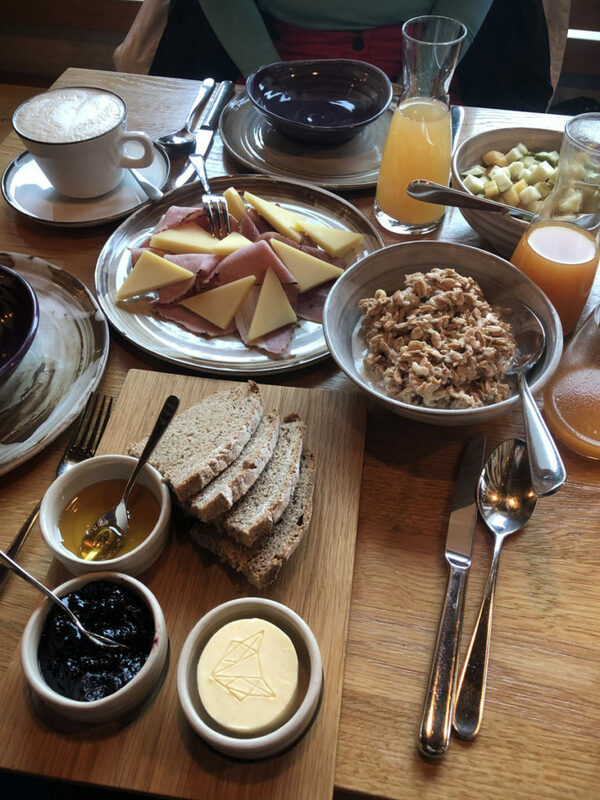 Fuxbau’s fantastic menu blends traditional recipes with a modern clean flair created in the Chef’s open kitchen. 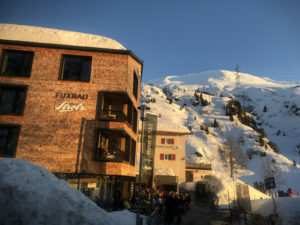 Fuxbau’s interior is chic alpine, with an intimate dining space – so reserve ahead. 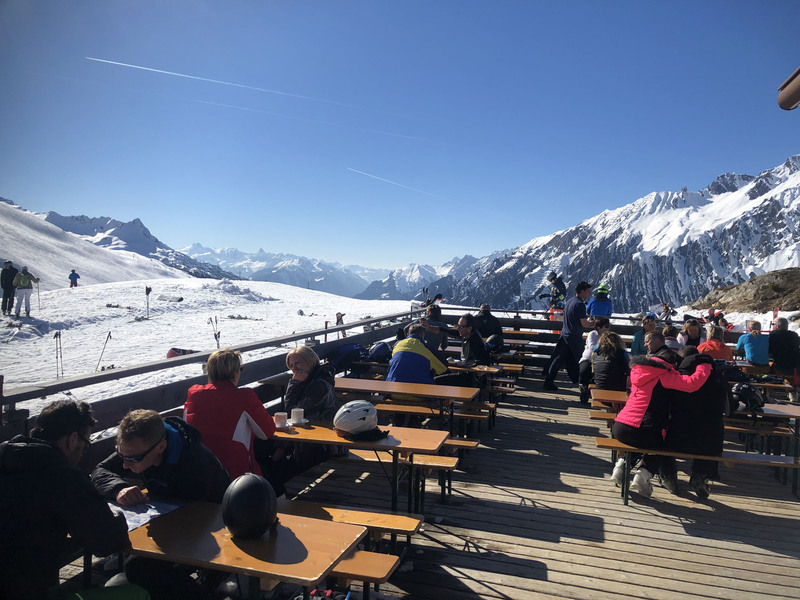 Outside at Fuxbau for lunch or aprés ski, enjoy homemade food, drinks from the popular umbrella bar, music and an amazing Alpen glow sunset in this gorgeous Alps valley. Even better, stay the night in this delightful alpine village of Stuben, upstairs at Fuxbau or its sister properties Das Johann Hotel and Alpine Lodges. 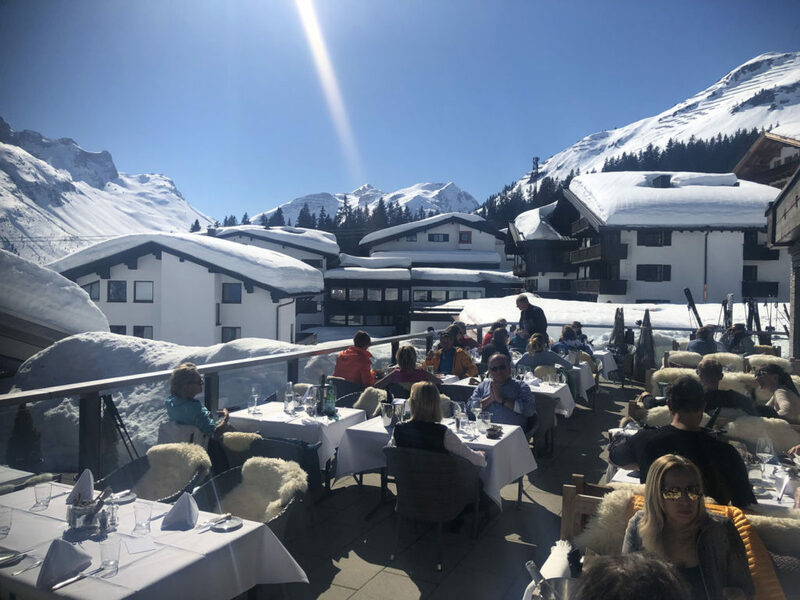 Bergkristall in Oberlech is alpine elegance defined for ski-to lunch or dinner, with some of the best food, fresh fish and steaks, in The Arlberg locals say. 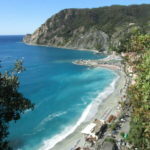 The Tutti Frutti pasta is legendary with lobster, scallops and shrimp. 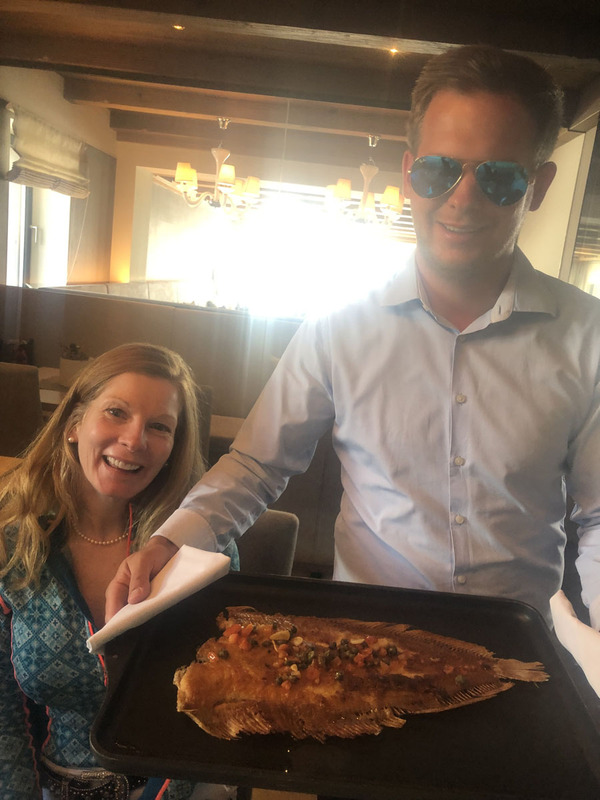 Our Sole was amazing, fresh fish daily in the ALPS! 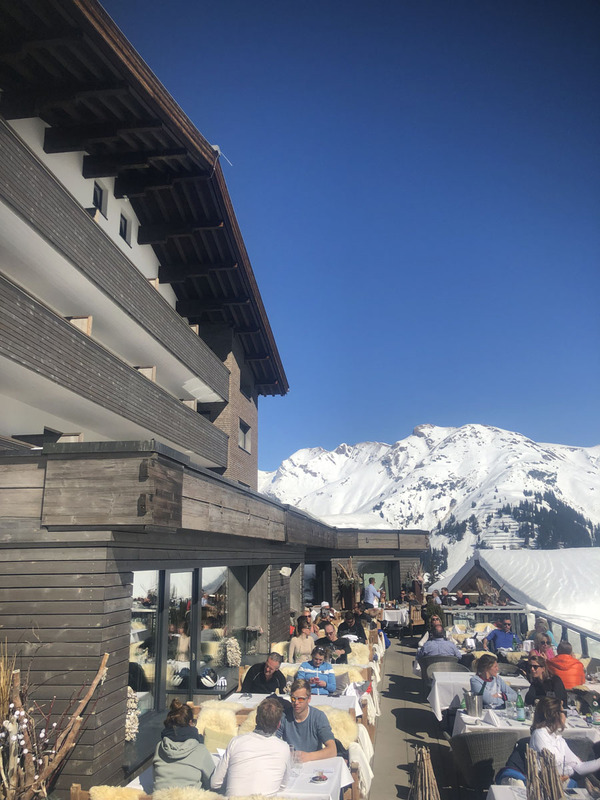 Sit inside the gorgeous dining room, at the sophisticated bar, or outside on sheepskin chairs with a stunning view and sunshine. 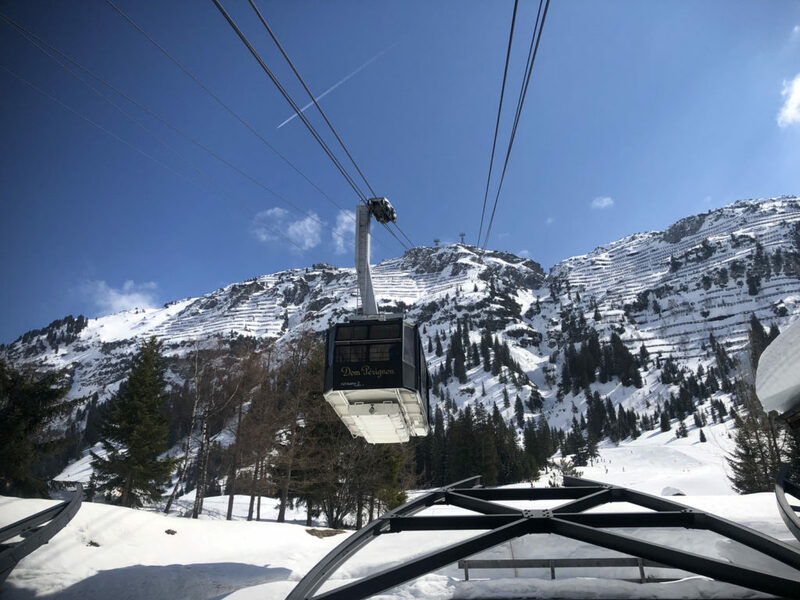 The ninth generation of Corinthian innkeepers will see to your needs, making it hard to go back out skiing after the cuisine and care. Next visit, I want to stay at Hotel Bergkristall. 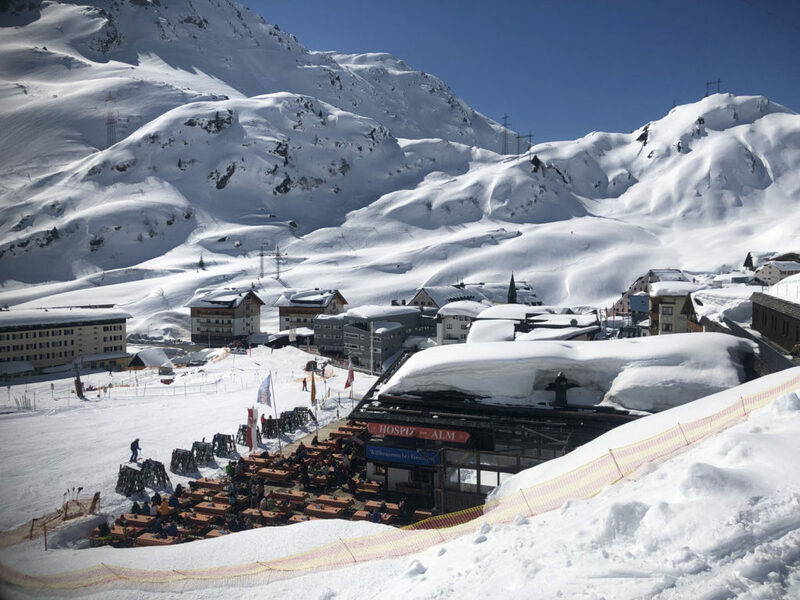 Rud Alpe in Lech is a traditional chalet right on the ski slope, Trail 200 and 201, with a beautiful vista overlooking Lech. 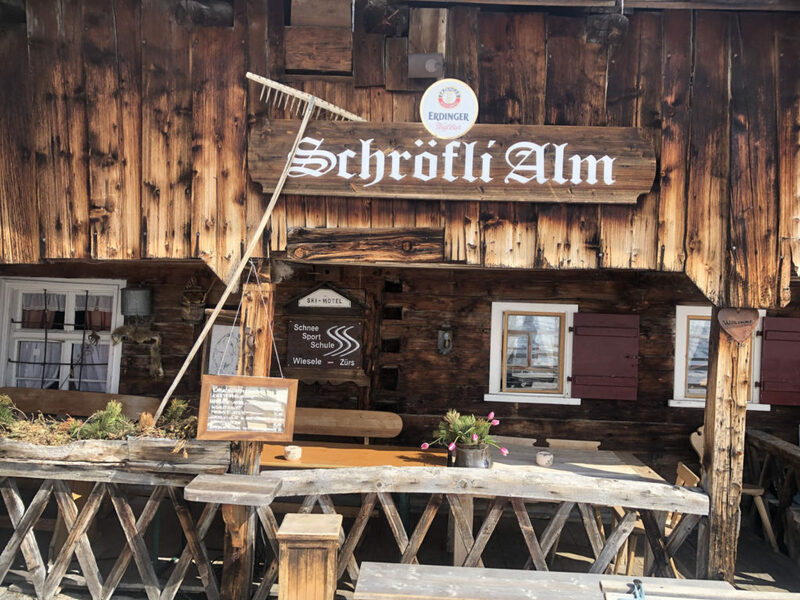 This authentic old barn with two floors is spacious, and serves hearty traditional Tyrol fare – soups and Rösti. 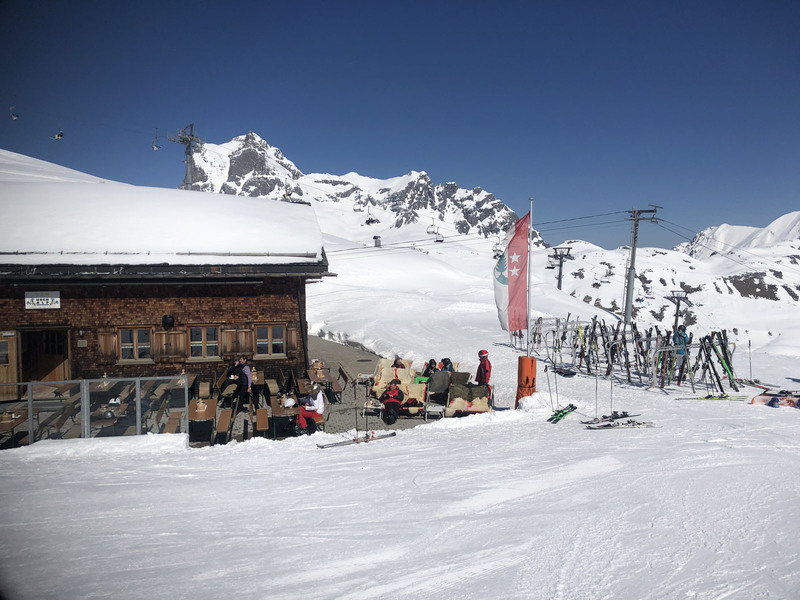 Rud Alpe is just a few ski turns above Lech village, so this place rocks aprés ski out on the sun and inside – which explains the playful, if not in-congruent, disco ball and dance floor in the historic hut. 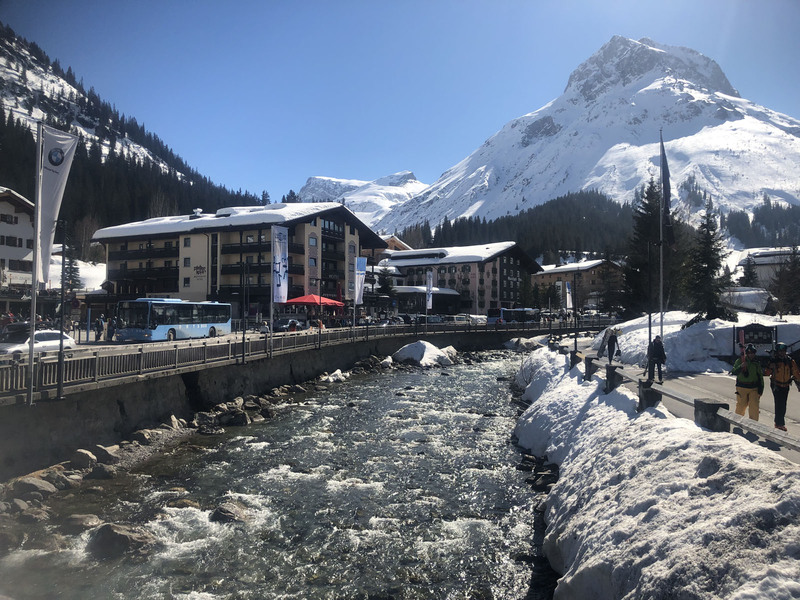 Mohnenfluh in Oberlech is a fabulous four-star hotel overlooking the slopes, with a grand sun terrace and lovely alpine dining room with mountain views as well. 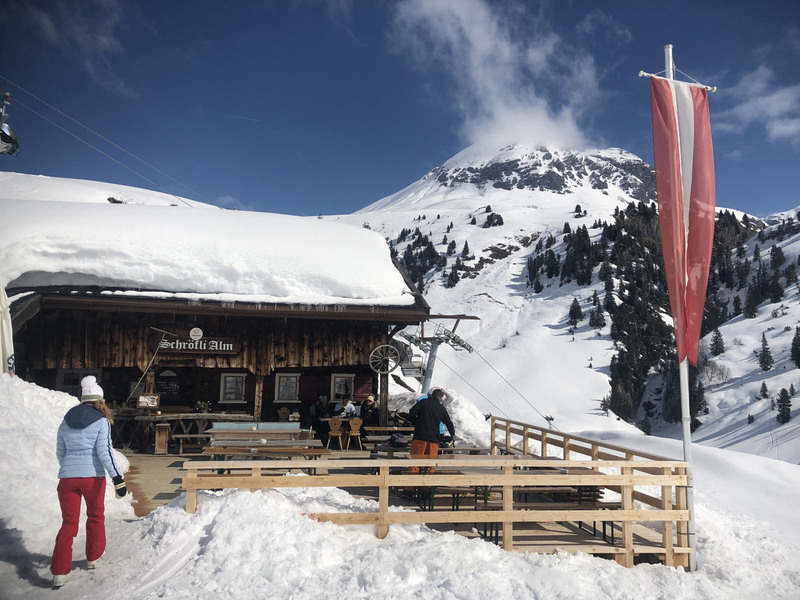 The Mohnen Burger is the best cheeseburger in paradise – or at least in the Arlberg we found. 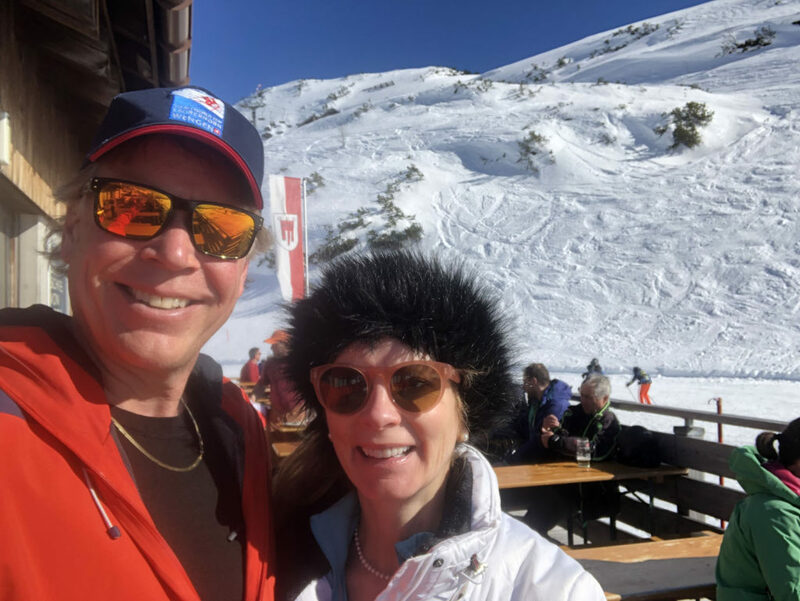 The Muxel family operate this chic ski hotel and the food, setting and service are top notch. Kaminstube in St Anton is a great slope-side chalet, just above the Mooserwirt. The classic hut interior is warm and inviting, try to score the circular window table by the door. 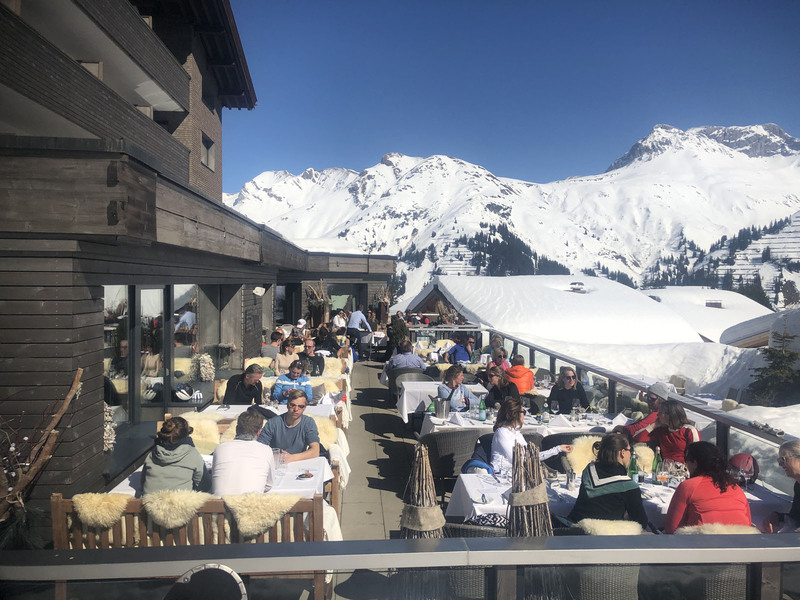 The salads, Gulaschsuppe, Grösti, and spätzle are all delicious and handmade. 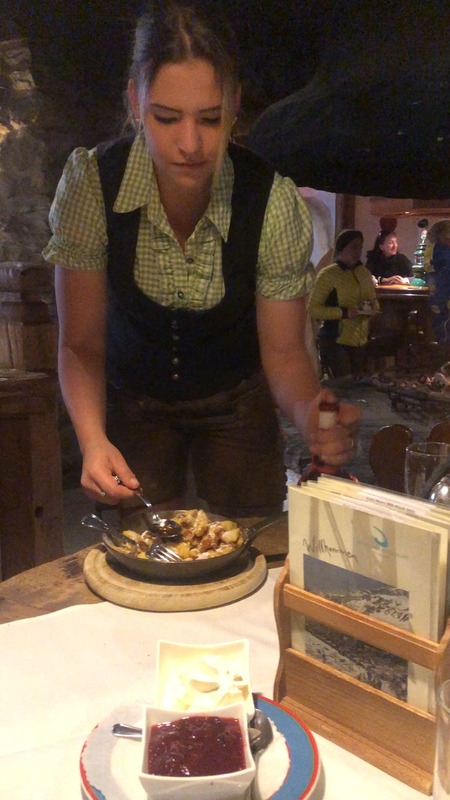 All the usual Tirol menu items are served like Weiner Schnitzl too. 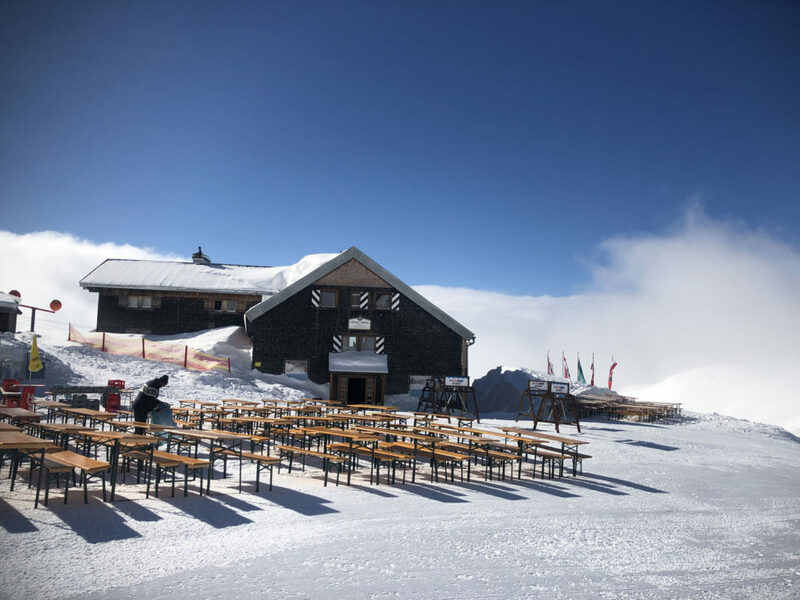 A perfect place to stop for a late lunch, on your way to aprés ski at Mooserwirt or Krazy Kanguruh. 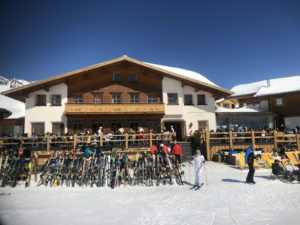 Mooserwirt in St Anton should be part of your last run for the best après ski – The Moosewirt claims to be “the worst ski bar in the Alps,” with humor, here hundreds of skiers drink shot skis, and dance to a DJ in ski boots inside the chalet, and out on the sun deck buy the umbrella bar in spring. St Anton actually has an ordinance that après ski must end by 8pm, strongly suggesting you should change out of ski clothes by then, drunk stumbling in ski boots through the otherwise elegant ski town of St Anton is discouraged. 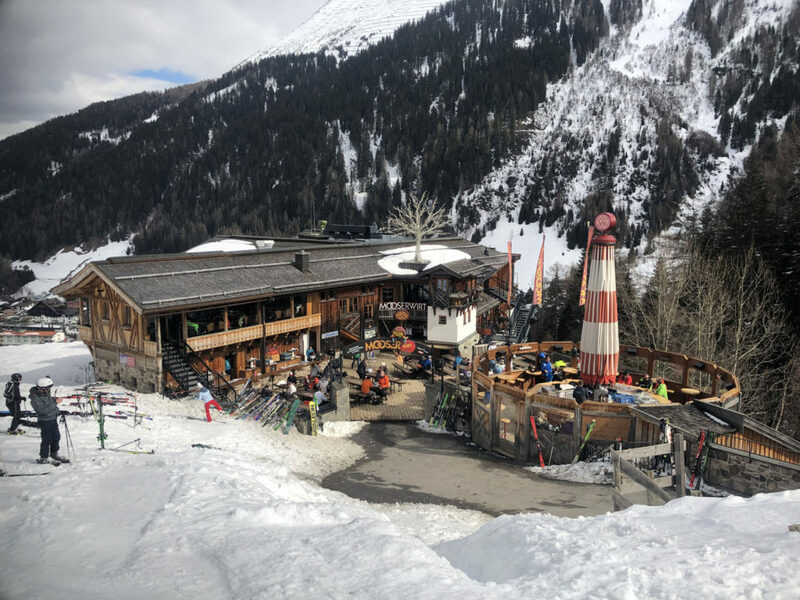 Krazy Kanguruh is another legendary St Anton Après ski bar, Trail #50 – Zammermoos which we call “aprés ski row”. The Kanguruh is owned by former Austrian downhill ski racer Mario Matt since 2009, but the party legends at “KK” date back to 1965. 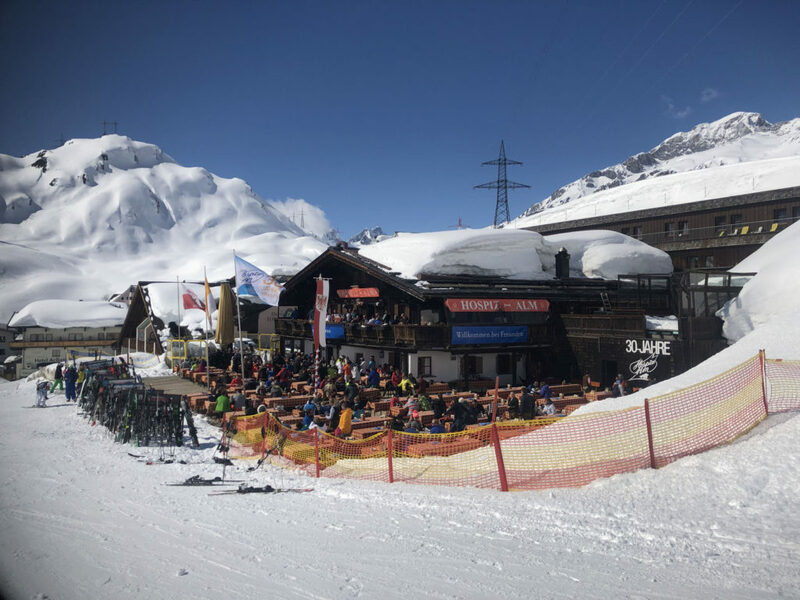 DJ Party Hard plays music and skiers frolic at this fun bar. 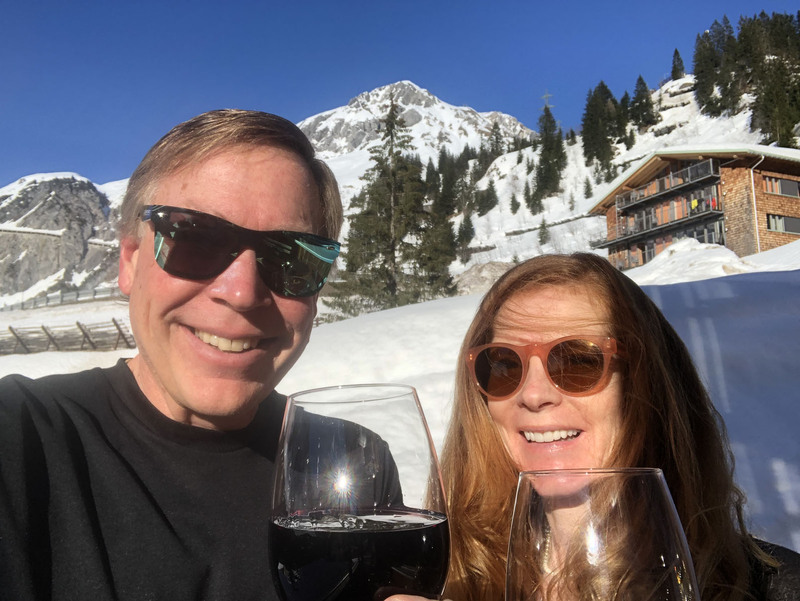 Next door Taps serves a more subdued “happy hour” style aprés ski. 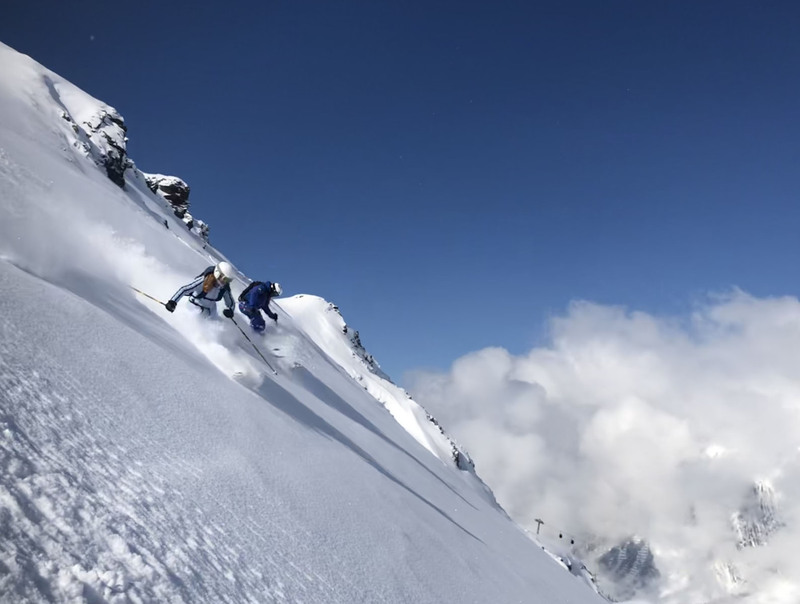 See our Review of St Anton in The Arlberg, one of the best ski resorts in Europe, and the world.